The $6.25 million equals $95/year, less than $8/month, for the average Hopkinton household for the first year, decreasing each year over the 20 year bond, starting in 2017. This cost projection includes construction, demolition, temporary relocation, the leasing of temporary space, and all the elements needed to cover the project from start to finish. The project budget also includes design and construction contingencies, as well as escalation costs to accommodate inflationary increases. Click here for the Estimate of Total Project Costs for the Renovated and Expanded Library. On August 7, 2014, the Massachusetts Board of Library Commissioners awarded Hopkinton Public Library its $4.5 million provisional construction grant for the renovation and expansion of our Library. Funding for this grant was made possible through the capital bond bill signed by Governor Deval Patrick on August 5, 2014. In January 2012, the Hopkinton Public Library Foundation (HPLF) announced that it would spearhead efforts to raise private funds for the expansion and state-of-the-art renovation of Hopkinton Public Library. Since then, HPLF has been working diligently to raise money through gifts from individuals, families, foundations, corporations, small businesses, civic and social groups, and special events. HPLF already has held numerous events, such as the Mother-Daughter Princess Tea, Touch-a-Truck, Pink Pint Night, Hoptoberfest, Library Mini Golf, and the Heritage Quilt Project, raising money and awareness of the library building project. 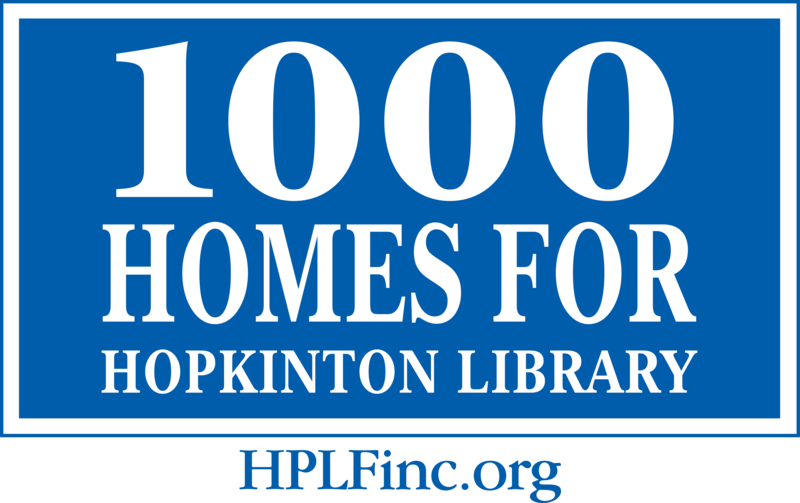 In October 2013, HPLF launched its 1000 Homes for Hopkinton Public Library Challenge with a goal of raising $1 million for the renovation and expansion of Hopkinton Library.